TimeLive Web-Timesheet suite is an integrated suite for time record, time tracking and time billing software. 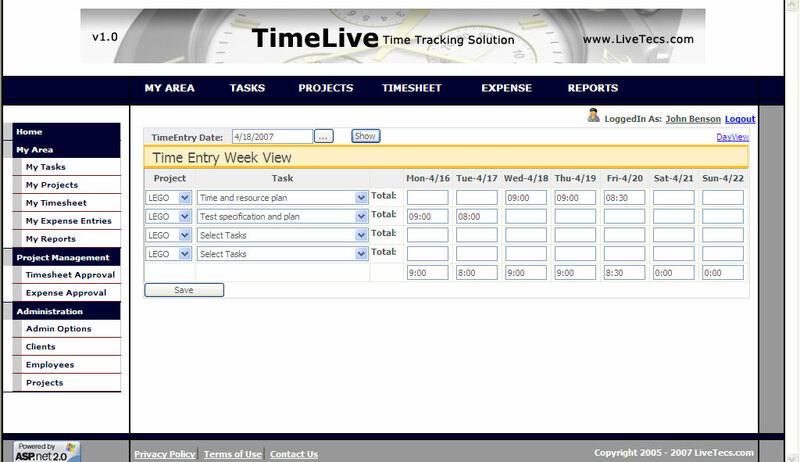 TimeLive Web-Timesheet delivers a time tracking solution for professional service providers. Each of our products has been designed to meet the time tracking needs of specific segments of the service provider market, including both time tracking & time & billing applications. Track leaves, vacations using easy to use integrated tool. ...... Clock in and out by simply clicking on your mouse. Track your regular hours, overtime hours, and flextime hours automatically. Track leaves, vacations using easy to use integrated tool. TimeLive Web-Timesheet is enterprise project management software that helps you save time on planning, processing, tracking and completing your projects. TimeLive offer you a new approach to Web collaboration based on email communication. Online collaboration brought to you by TimeLive makes your plans thrive - updated information is distributed among team members. * Fully integrated project management and collaboration tool. * Personalized overall summary view of projects for Project Manager and Team Lead. Qweas is providing links to TimeLive Web-Timesheet 3.2.1 as a courtesy, and makes no representations regarding TimeLive Web-Timesheet or any other applications or any information related thereto. Any questions, complaints or claims regarding this application TimeLive Web-Timesheet 3.2.1 must be directed to the appropriate software vendor. You may click the publisher link of TimeLive Web-Timesheet on the top of this page to get more details about the vendor.